On the courts of the NBA, hes Rafer Alston, but on the playgrounds across America hes known as "Skip 2 My Lou". Before Alston suited up in NBA threads he was "breaking ankles" and "dropping dimes" on some of the greatest street-ball courts around  most notably Rucker Park in Harlem, NY. The playground legend earned the nickname "Skip 2 My Lou" as his trademark move was to "skip" down court when he dribbled. After playing college ball at Fresno State and stints with Milwaukee and Toronto, it looks like hes finally found a home with the contending Miami Heat as he averaged 10.2 points per game and 4.5 assists this past season. And he played in all 82 games. But beware, because "Skip" still frequents the blacktops during the summer. So dont become a victim! 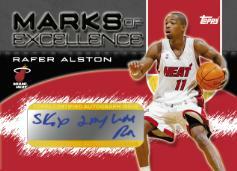 Topps is pleased to announce that the legendary Alston has signed "Skip to My Lou" on all of his autographed basketball cards appearing in 2004-05 Topps Basketball, which releases August 16th. Each 10-card pack of 2004-05 Topps Basketball carries a $1.59 SRP.